For information about Whole Foods Friday, take a peek at the tab at the top. There's not much better than a loaf of freshly-make bread to to along with that pot of buffalo stew. This recipe doesn't require as much kneading as some recipes since it has an overnight rest in the refrigerator that activates the gluten in the flour. There's still a little bit of kneading - but you can do it in a bread machine, with a stand mixer, or by hand. White whole wheat flour has all the advantages of regular whole wheat, but the flavor isn't quite as strong and the texture of the bread will be softer. It makes a great loaf for people who aren't quire ready to give up white bread. Combine all of the ingredients and knead until the dough begins to become elastic. This is easiest to do with a stand mixer, or bread machine - the dough is very soft and wet. If you're kneading by hand, it might be easiest to knead in a bowl using a couple of plastic bench scrapers to pull and fold the dough rather than doing a more traditional knead. You don't need to get the dough completely elastic - just starting to get elastic. Drizzle a small amount of olive oil into a zip-top plastic bag and transfer the dough to the bag, making sure it's lightly coated with oil on all sides. Seal the bag and place it in the refrigerator overnight, or up to a day. After the rest, remove the bag from the refrigerator and place it on the kitchen counter. Open the bag to release the air in the bag. Massage the dough a bit in the the bag. then let it warm up to room temperature - at least an hour, or up to two hours. Like a baking sheet with parchment paper and preheat the oven to 350 degrees. Flour your work surface and turn out the dough. Knead it briefly, adding only as much flour as required to keep it from sticking. Form it into a log about 10 inches long and place it on the prepared baking sheet, seam-side down. Cover the dough with plastic wrap and set aside until the dough doubles in size - the time will depend on how long you let it warm up, and how chilled it was to begin with - anywhere from 30 minutes to over an hour. The time is less important than that the dough had doubled in size. Remove te plastic wrap. If desired, brush the dough with plastic wrap, then sprinkle with sesame seeds. Slash the loaf as desired, then bake at 350 degrees until nicely browned, about 35 minutes. Let the loaf cool completely on a rack before cutting. Lovely bread ... I could almost take a bite of the photos! Please edit this recipe to include the amount of yeast needed to complete this wonderful looking bread. Fantastic. Looks surprisingly light and airy. Cheers! 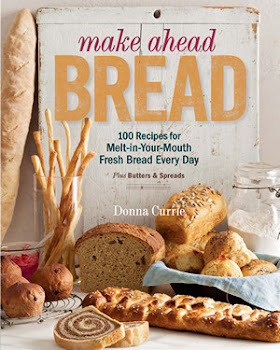 Donna, what a delicious looking bread. What a crumb and beautiful crust too. What a gorgeous loaf, Donna. I love the holes in it. I've become a pretty big fan of white WW flour and use it regularly. hello, what a great bread, i want to try it but i dont have a White whole wheat flour, can i use just white flour? thank you. You can use all white flour if you lie. If you like whole wheat, you could use about 1/3 whole wheat and 2/3 bread flour, as well.